The fire crackled with life as it swept its way across a stack of manuscripts, greedily consuming page after page. Through tears I watched the pristine white papers transform into thin, black feathery curls that peeled off, danced momentarily with the updraft and then drifted resignedly down into the ashes. I thought I might be able to rescue a scrap or two by pushing some of the charred lumps to the side of the fireplace, but my mother must have read my mind. She grabbed the metal poker and stabbed at the carbon-coated mass to separate the blackened pages; she was determined to destroy every remnant. I could smell the words in the stench of burnt ink that wafted around me. I was 14, and newly enamored with the life and writings of Laura Ingalls Wilder. This was my first experience with death. She flung the poker wildly, just missing my head, and staggered from the room. I stayed there for hours, sobbing and staring at the black pit long after the fire died, trying to come to grips with the idea that every word, every sentence, and every page of every story my mother had ever written, was gone forever. Today, nearly 40 years later, I am profoundly aware of the significance that moment has had in my journey. Somewhere in my heart, I believed her. I’ve spent the past 40 years skipping along the edge of the sea, yearning. Occasionally I’ve ventured ankle-deep, savoring the warmth and trying to imagine what’s “out there.” But I’ve never leapt with abandon. People ask me what I’m afraid of, and I remember the charred remains of dreams and the scent of unread words. It is my image of hopelessness. That was the image in my heart this morning after I missed yet another self-imposed writing goal. I could hear my mother mocking me, reminding me that I have no business dreaming when there’s work to be done. Another failure. Who am I fooling? But I cannot quell that constant, gentle song of unwritten words that calls to me above the din of the world’s demands. As is my habit, rather than follow the call, I tend to lash myself to the Siren of perceived obligation that is my “real job.” How did things get so backward? I’m reminded that I can start again and again, as often as I wish to, because I have hope and a future. There’s a whole big ocean of possibility out there and I’ve not even dared to snorkel across the top. The only thing stopping me is me. I can choose whether to listen to voices past or the voice of the future. It’s not a waste of time. It’s His plan. Then tell him that, and say you’re sorry. So, you think that by staying angry, you’re going to make him sorry? Isn’t that somewhat manipulative? Then write him a letter. Say you’re sorry. I stare at the paper, too angry to write. I won’t be a hypocrite. But I can picture Jesus, one eyebrow raised as He waits. Hey now! That’s not the way I taught you. Nothing? Well for starters, you could apologize for trying to be me. Last time I checked, it was my job to change people. My sarcasm gets the best of me, and before I know it, I sputter out an ace of a retort. Haven’t I though? What are you thinking right now? I refuse to answer. Instead, I fold my arms across my chest. I really hate it when He’s smug. Come on, He coaxes. You know you want to. He’s referring to a quote by some anonymous author that I have pasted on my FaceBook page. It makes me smile. He used my own words against me. “I can’t believe you went there,” I say. He grins, and points back to the paper. I know He’s right. I know it’s the only way. There’s only one part of my life I can control—my own actions. I pick up my pen and start again. Just writing the words, I feel release. Today I have the honor and privilege of introducing you to Columbus Abbit Frank, a U.S. Marine veteran who fought in the battle of Iwo Jima during World War II. Our family has known Frank for many years (he’s my husband’s uncle―who, incidentally, has been known only as “Frank” since he attended boot camp in 1944), but we never took the time to learn his story. All we knew about him was that he had fought at Iwo Jima. In the 90s, Frank and his wife, Loretta, came to visit us in Northern Virginia, and we took them to a Sunset Parade at the Marine Corps War Memorial in Arlington (an amazing demonstration that I’d encourage every American to experience at least once). Because of Frank’s service at Iwo Jima, he was seated in the hosting general’s section. 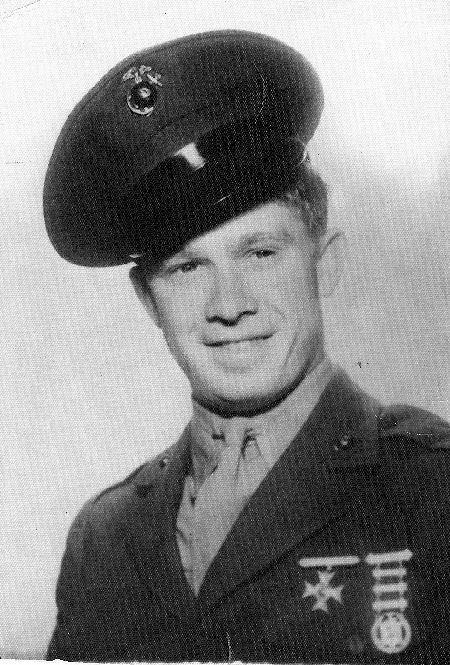 Frank, then in his late-70s, wore the requisite veterans’ Iwo Jima ball cap as he walked past the gauntlet of civilians and Marines toward his seat. Every Marine who noticed the cap snapped to attention and saluted, adding either “Oorah, Sir,” or “Semper Fi, Marine,” or even just, “Thank you, Sir.” I’ve never seen a man treated more honorably, and was more proud of the Marine Corps at that moment than I’ve ever been, before or since. By the end of the night, Frank’s face was beaming, and his pride was evident. Still, we didn’t ask for the entire story. Nearly 20 years later, we visited the monument again, this time with our youngest. We told him about the battle, and that his great uncle had fought there, but we had no details to add. It was an awakening of sorts. We realized with regret that we’d been taking for granted the living history available to us just for the asking. So, we set out to capture his story for the family archives, and got much more than we’d expected. Not only is this an incredible war story, but it also tells of a strong, hard-working man who refused to be kept down by the hand originally dealt him, and who made his own way in the world despite the challenges of his childhood. He is the epitome of Real America, where a person can advance as far as he can dream, if he’s willing to work for it. Better yet, Frank has not only allowed me to tell his story, but also to hang it on my Portrait Page so we can share it with you. I hope you’re as inspired as we are by this ordinary man with an extraordinary story. NOTE: Special thanks to Charles, my 14-year-old, who conducted the interview on a recent trip to Sacramento, and to his dad for getting him there. God Bless you, Uncle Frank, and thank you for your service.